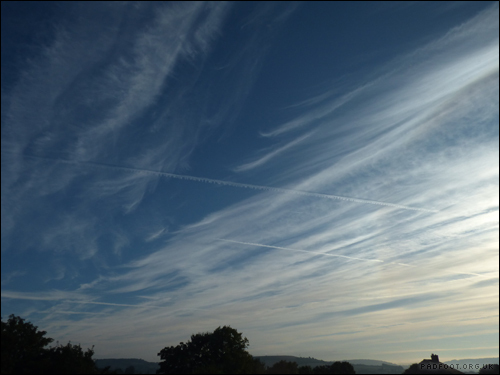 Quite a combination of clouds for this morning’s photo, but the two vapour trails set it off brilliantly! 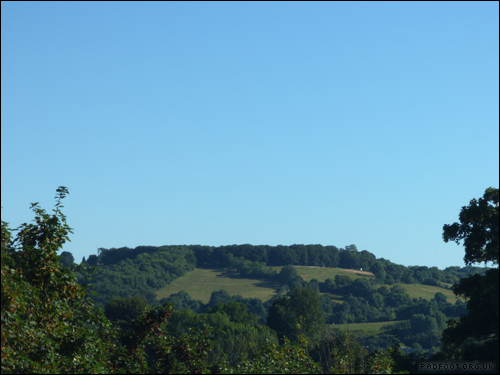 This entry was posted in Dragon Goes Wild and tagged #StayWild, 365 days wild, Cloudscape on August 31, 2016 by Dragon. 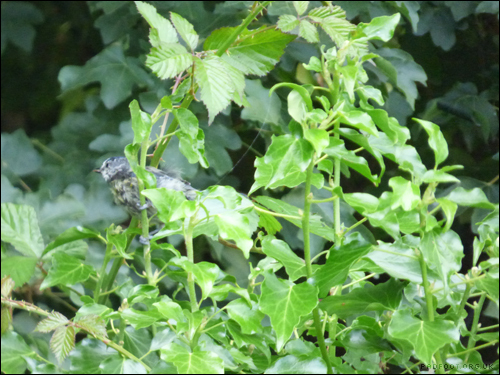 It’s not me hunting for insects, but a Wren in the garden – standing near the kitchen window, I suddenly spotted this little bird sitting in one of the shrubs in the garden. 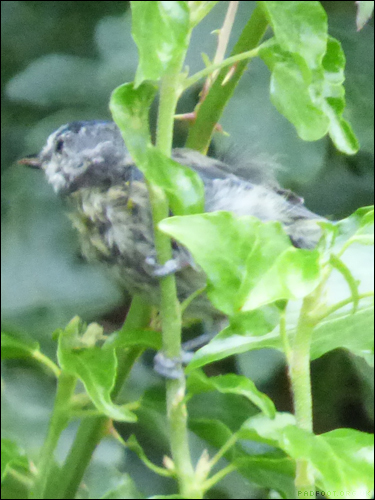 Wrens don’t eat “human food”, preferring insects and aphids, so by the time little little one has finished, I think that shrub should be free of greenfly at least! 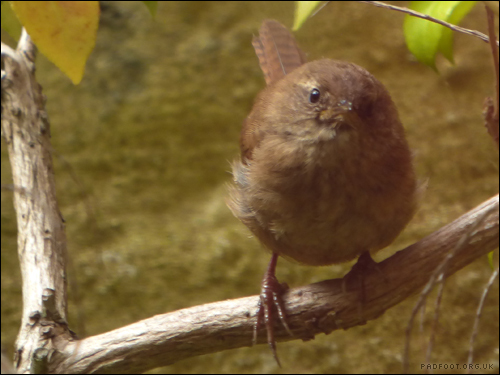 This entry was posted in Dragon Goes Wild and tagged #StayWild, 365 days wild, Wren on August 30, 2016 by Dragon. 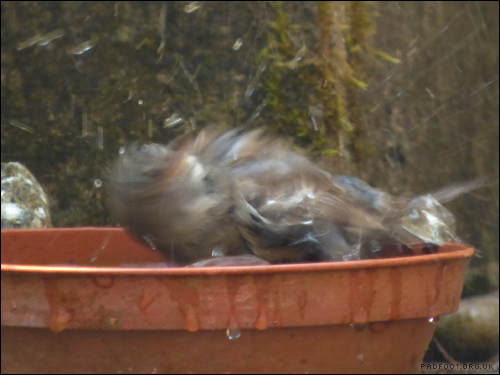 The sparrows have returned again, not only for food, but also for a bath! 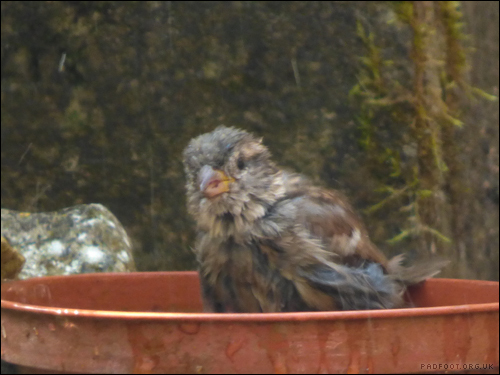 Three sparrows were in the main bird bath, so this clever youngster decided to have a bath all to itself in the plant saucer instead. This entry was posted in Dragon Goes Wild and tagged #StayWild, 365 days wild, House Sparrow on August 29, 2016 by Dragon. 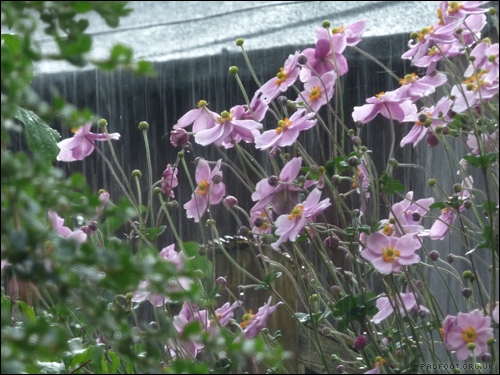 It’s not the clearest photo, but spotting some raindrops hanging from the edge of the window, I thought I’d try and be creative…. 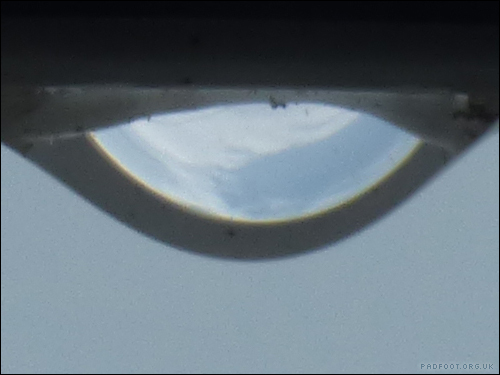 ….so here’s my photo of a raindrop, with the (upside down) reflection of the clouds. 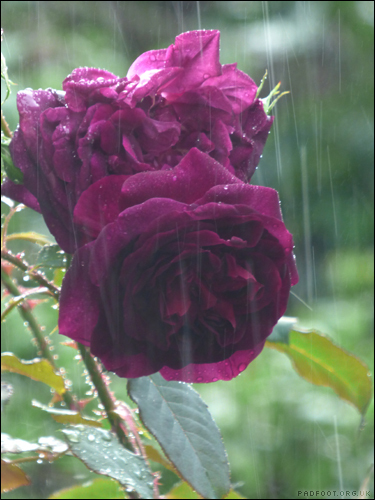 This entry was posted in Dragon Goes Wild and tagged #StayWild, 365 days wild, Raindrop on August 28, 2016 by Dragon. Do you leave water for the birds? 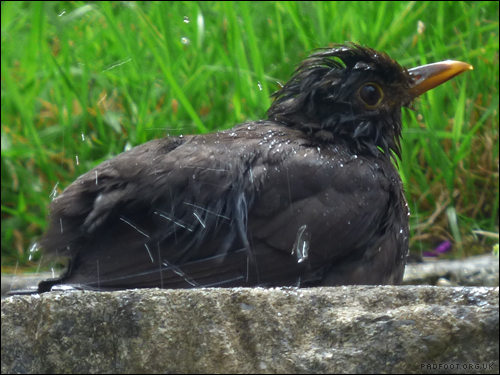 With the hot weather that’s been forecast, we’re making sure to keep the bird bath topped up. Not only do the birds enjoy a cooling bath, but they also can drink from it. 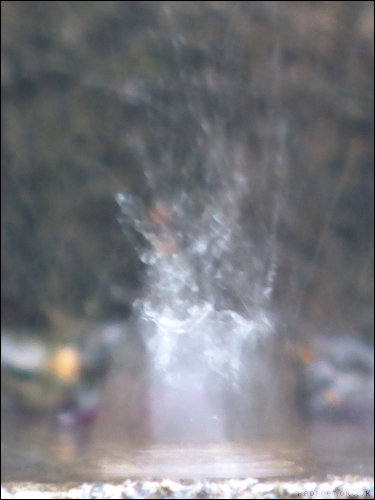 For the smaller birds, we also have a water-filled plant saucer with a pebble in – the pebble helps to stop the pigeons from tipping it over, but also means the very small birds can get some shallower water to bathe in. It’s not just the birds that use the bath though, I’ve seen a fox come into the garden at night and take advantage of some drinking water! 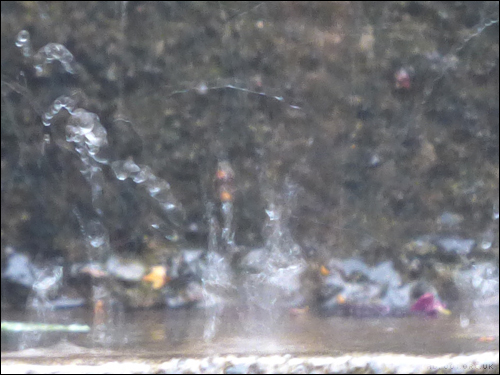 We also have had numerous visits from a badger (we haven’t spotted it recently, but we have seen the ‘deposits’ that it’s left behind), and I’m guessing that the badger is also making the most of the water. 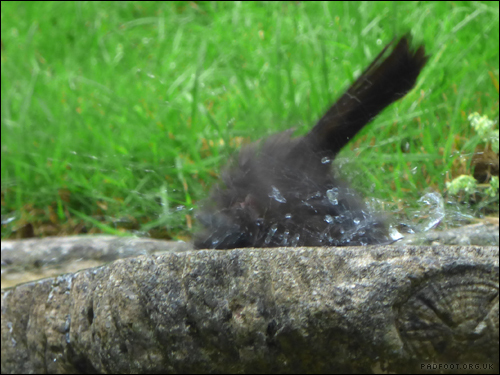 This entry was posted in Dragon Goes Wild and tagged #StayWild, 365 days wild, Bird bath, Hot Weather on August 24, 2016 by Dragon. When you think of a garden house-style bird feeder, you think of small birds flying into it to get the food. The local larger birds have other ideas,with a seagull sitting on the top of the feeder, trying to figure out how to get in! 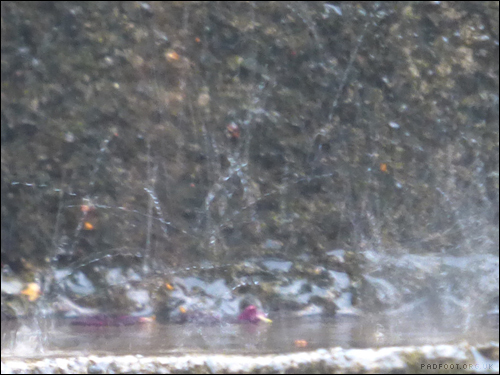 The gull didn’t manage it, but the local crows proved brave enough (or hungry enough) to squeeze in and grab some food. 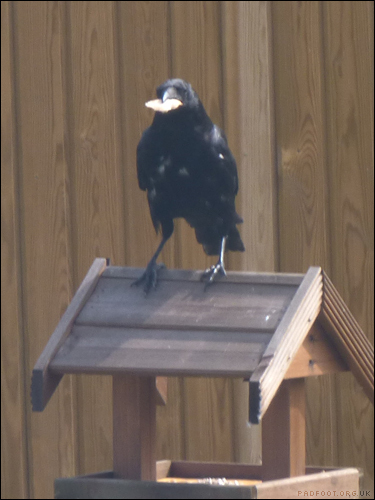 Taking it on top of the feeder, the crow then started to pull the food apart to eat…. 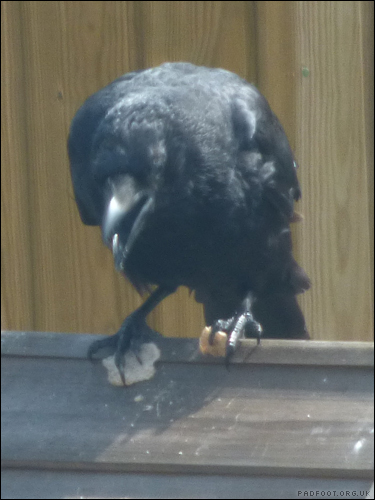 the few pieces it dropped were quickly gobbled up by a second crow sitting on the grass below – that one obviously knew that would be the easy way to get the food! 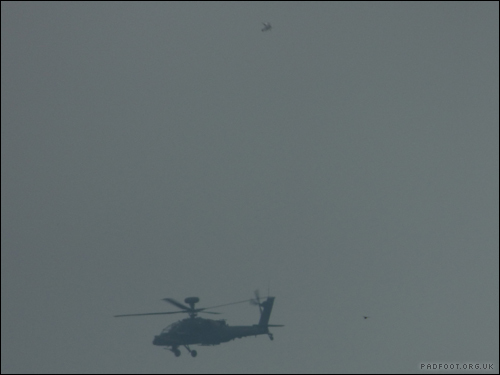 This entry was posted in Dragon Goes Wild and tagged #StayWild, 365 days wild, Crows on August 23, 2016 by Dragon.